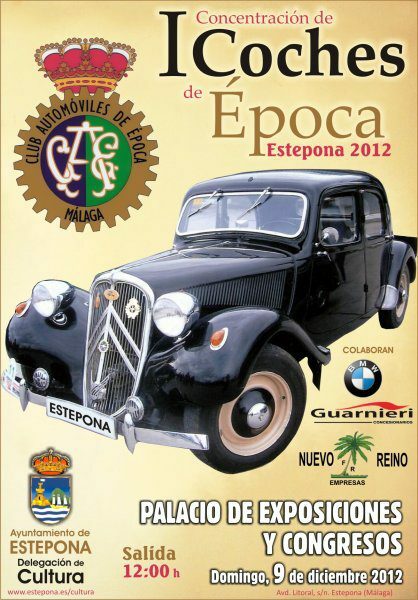 The municipality of Estepona in Malaga hosts this coming Sunday, December 9, the first gathering of vintage cars consisting of some 40 vehicles registered between 1920 and 1960. The convoy, organized by the Vintage Car Club of Malaga, will tour the streets of the Costa del Sol town, departing at 12 noon from the Exhibition and Congress centre in Estepona. The tour will end in the vicinity of the Plaza de Toros. Among all vehicles, feature a 1920 Steyr, unique in the world; a Buick from 1929 that belonged to the family of Garcia Lorca; a Citroen 11 from 1939 or a 1948 Chrysler Imperial, a present of the car entrepreneur Eduardo Barreiros to General Franco. The Vintage Car Club of Malaga which is the oldest in Malaga province was founded in 1990. This non-profit association has among its main objectives to rescue and restore old cars, among others. Although the club is made up of nearly 50 members, each of them has more than one car, highlighting one of the partners, who has 72 cars; hence each concentration is a special opportunity to see these unique vehicles.